Our hours are by appointment only. Every fitting is an intimate affair, and each client deserves our undivided attention. Will I know how much the alterations will cost before the dress gets worked on? Yes. During your first visit, we tell you exactly what your alteration project will cost. If there are options to having something special done for your dress, your seamstress will be able to price those options to help you make the best decision. Should my wedding party members make appointments for their fittings? Appointments are necessary. Because there are busier times for our locations and we never want to rush through an formal fitting. Making appointment online or calling ahead will assure you dedicated time. Should I bring anyone with me for the fittings? Yes. We recommend brides bring someone that will be available to them the day of the wedding. It’s a good idea to have someone with them on the fitting. We’ll take the time to teach them how to connect the bustle for the day of the wedding. It’s also comforting for the bride to have someone that can help them get into your gown. The fittings are a great time to watch and learn how they can help, and practice if they wish. How many fittings are required for a bridal gown alteration? On an average there are three fittings total. The initial fitting, the second visit is a try-on following the alterations and the third visit can be a simple pick up after the dress has been steamed and/or pressed. If the alteration process is more involved there may be a need for additional fittings. My dress does not have a bustle. Can I have one made? Absolutely. Custom bustles are made for ease in function to compliment the style and design of your wedding gown. We will look for places to hide ribbons and snaps so they are not noticed before the bustle assembly. What should I bring for my fitting? The dress, all undergarments you intend to be wearing on your wedding day along with your shoes. Some brides like to bring their veil so they can get the complete look reviewed by our seamstresses. We remind brides all these items will be needed for each of their fittings. How much time should I allow for my wedding dress alterations? We tell brides six weeks out would be the most time recommended. The number of fittings will depend on the amount of work that is necessary. To ensure a perfect fit on your wedding day we recommend having your last fitting just a week or two before your wedding day. What timeline do you recommend for bridesmaids and mother’s formals? Two week or three at the most. Again, use your judgement based on how much work is necessary. Common alterations on formals take one fitting and a try on the day the dress is picked up. If something more needs tweaked, another visit may be required. We try to make the process as simple and convenient as possible. We also recognize many wedding attendants are coming in from out of town…we work to accommodate everyone’s schedule as best we can. If I’m losing weight, when and how long before I need to start the alteration process? Depending on just how much work is required we recommend you plan for a minimum of two or three visits, with 4- days at least between visits for the work to be completed. I was measured for my dress why do I still need alterations done to my gown? Wedding gowns are designed for what is considered the ideal figure which is a balanced body shape. The standard height for the ideal figure used for designing a wedding dress is about 5'9". There are---no figure exaggerations on this figure type--- thus creating what is considered the balanced body shape. Each manufacturer have their own standard measurements they go by. The point we want you to know is... "if you don’t match the designers' ideal figure proportions exactly you should expect to need bridal alterations." Unfortunately only 10 percent of women match the measurements. That's why most need some type of altering done to their wedding and formal wear clothing. Have sewing alterations done by the right person for your wedding gown? When it comes to having sewing alterations done to your wedding dress you need the right specialist. Most of you will use the seamstress that works at the bridal salon. 1. The alterations cost too much at the bridal salon. 2. You bought your gown out of town. 3. You have fitting issues that were not fully addressed at the salon. 4. The bridal shop cannot get your alterations done when you want them. 5. The bridal shop will not do your alterations because you didn't buy your gown there. The above are the most common reasons for needing to find us to alter your bridal gown. Who should you choose to do your wedding dress alterations? You want to choose a sewing professional who has had a lot of experience with altering wedding dresses. It is best to pick someone who specializes in wedding alterations for bridal gowns and other formal clothing, or at least do a large amount of wedding dress alterations as part of their overall alterations business. It is really hard to say how many years of experience a sewing professional should have in doing sewing alterations for wedding gowns. What you need to know is how much of their total sewing experience is based on altering bridal gowns. "A sewing professional that specializes in altering wedding dresses for 3 years doing at least 25 or more dresses a year can actually be more experienced than someone who has 10 years sewing experience and only do 3 gowns a year. So the years as well as the number of gowns they work on average a years need to be considered." You also can't automatically assume that the bridal shop seamstress is qualified to alter your wedding gown. There tends to be a lot of turn over in some bridal shops and so they have to hire people and teach them on the job. For this reason some brides are planning a head of time use a wedding dress alteration specialist like us instead of the bridal shop seamstress. Is your bridal dress too small or too big? Re-sizing your bridal dress is what you need when . . .
"Your gown is so small . . . that you can't zip it all the way up." "Or it is so big . . . that it hardly touches your body anywhere." Resizing your bridal gown is a little different from altering a gown. How so? Usually your dress fits at least in one area but is a little loose in another. This makes it necessary to have you bridal dress adjusted by having it altered to fit correctly. When resizing is needed, the dress is too big or too small everywhere! This involves mostly the bust, waist and hip areas. This means the gown is usually 2 or more sizes too big everywhere. 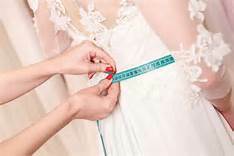 Brides encounter this problem because of size changes or the gown order comes in two or more sizes too small or too big. "Don't worry!" "There is a solution to this problem." Independent wedding dress alteration specialist or bridal shop seamstress--Which should I choose? Why choose a Wedding Dress Alteration Specialist and not the bridal shop seamstress? A sewing professional who has their own business is committed to making you happy! They will go out of their way to do so. They communicate with you on a more personalized level. Their expertise in fit and workmanship is of the highest standards! Since the majority of their business is altering wedding dresses they are very skilled in working with wedding dress fabrics and fitting bridal gowns. They have as much experience working with bridal gowns as a bridal shop seamstress. What if your wedding dress is too small and will not zip up in the back? Some wedding dress styles can be converted to a corset wedding dress. When you have an opening that spread apart at least 3 inches or more, adding a lace up back can be the perfect answer to a problem.This solution works better than adding panels to the side seams which sometimes will not blend in, and may be noticeable. What if you are a pregnant bride? If you have already bought your gown, then you may be able to convert the back of your gown to a corset back to give you more room. A bustle lifts the train up in a decorative fashion off of the floor so that you don't have to carry the train on your wrist or over your arms. Very few wedding dress designers have a bustle built in the dress, so you will have to have your wedding dress alterations specialist add a bustle to your gown. A bustle makes it convenient for you to walk around and dance without the train getting in your way. It is held up on the skirt of your train by sets of hooks and loops or buttons and loops. One bustle style uses sets of ties or a set of ties and loops to hold the train up. Do I need a bustle for my wedding gown? If you have a chapel length train or longer you may want a bustle. As mentioned before you will be able to keep you hands free for the reception. You especially need one if you will be walking around and dancing in your gown for hours at the reception. You don't need a bustle if you have a short sweep train. You also may not want a bustle if you only will wear your dress for a short time. Otherwise, it is worth the cost to have one added to your dress for the convenience of it. Can you make me a custom wedding dress? Yes, but I am sorry to say that I don’t make you a custom wedding dress at this time. I used to design and make wedding dresses and I really enjoyed it. But right now I have decided to take a break from making bridal gowns and continue with bridal gown alterations. "But guess what I will do?" "Instead of making you a custom wedding dress, I can re-design your wedding gown, l call it a "wedding dress makeover." 1. You can have necklines changed, sleeves added or taken off and skirts narrowed. 2. Adding a detachable halter strap can easily transforms a gown. 3. You can have beaded trim added or lace applique sewn on. 4. Trains can be shortened. Detachable trains can be made, and added to wedding gowns without trains. 5. Dresses can be made into a lace up corset back wedding gown, which is a popular style detail. 6. Sashes are popular and can add color to your wedding dress. 7. Hems can be shortened to tea length or made into the high low hemline. "There is so much that can me done to modify a wedding gown into the perfect wedding dress for you."